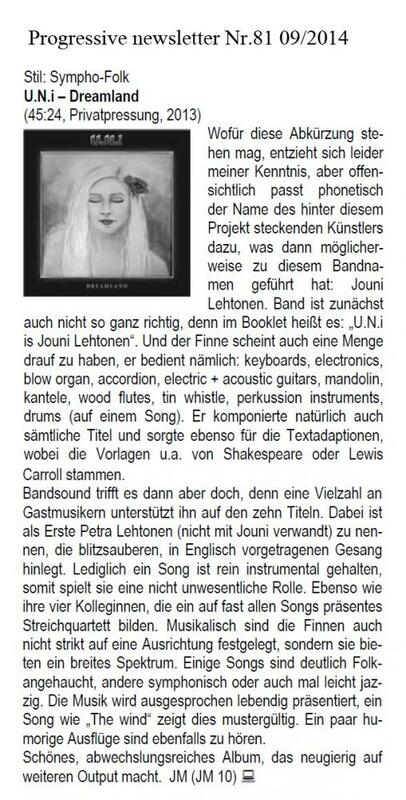 U.N.i is a music project created by composer and multi-instrumentalist Jouni Lehtonen. 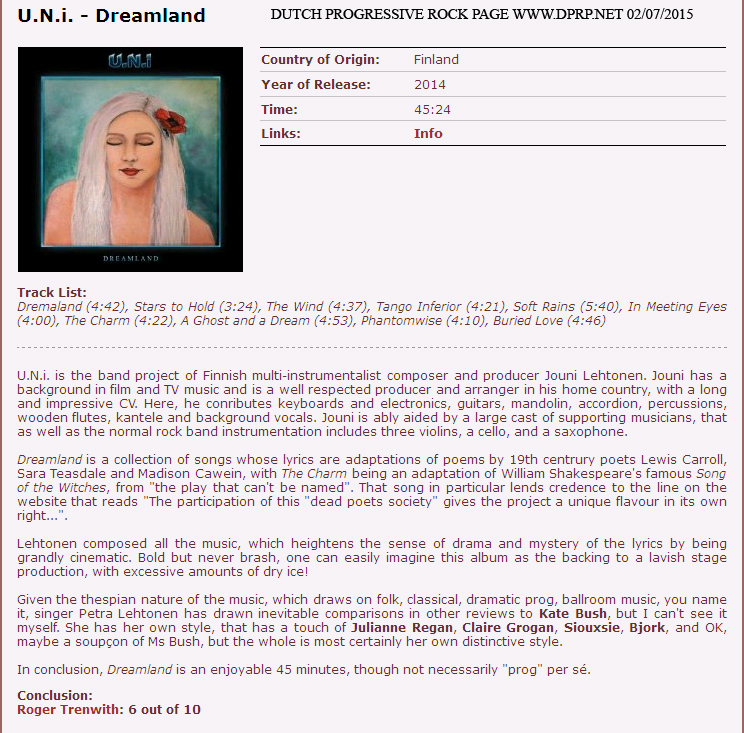 U.N.i's first album is called Dreamland, a collection of 10 songs stylistically moving somewhere between progrock, folk and electronic, with some tango, circus and celtic styles thrown in. 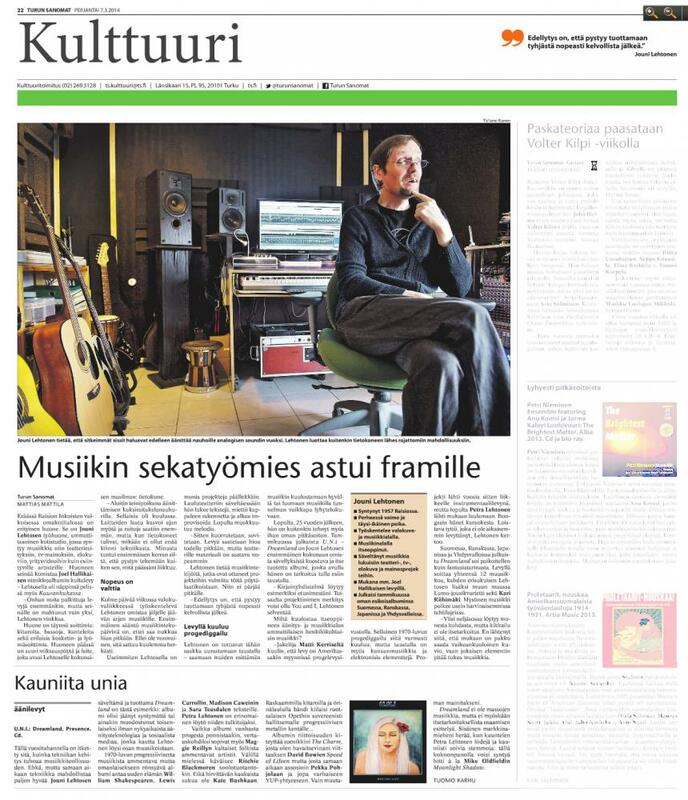 All the music was written, arranged and produced by Jouni Lehtonen. Several guest musicians took part in making of the record, most notably Petra Lehtonen (no relation to Jouni) who sang the lead vocals. All the lyrics are adaptations from public domain poems by for example William Shakespeare, Lewis Carroll and Sara Teasdale. 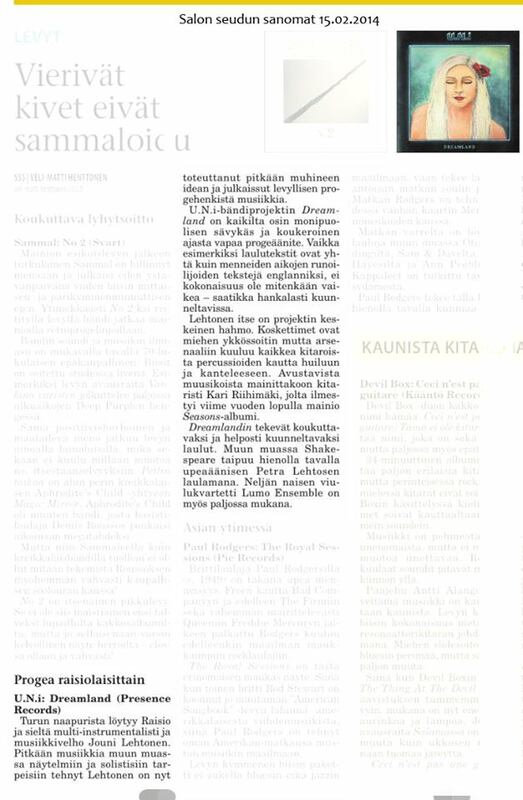 The participation of this "dead poets society" gives the project a unique flavour in its own right, not to mention the compositions themselves which have a somewhat cinematic feel to them -perhaps due to Jouni's previous involvements in the theatre scene and music for picture. 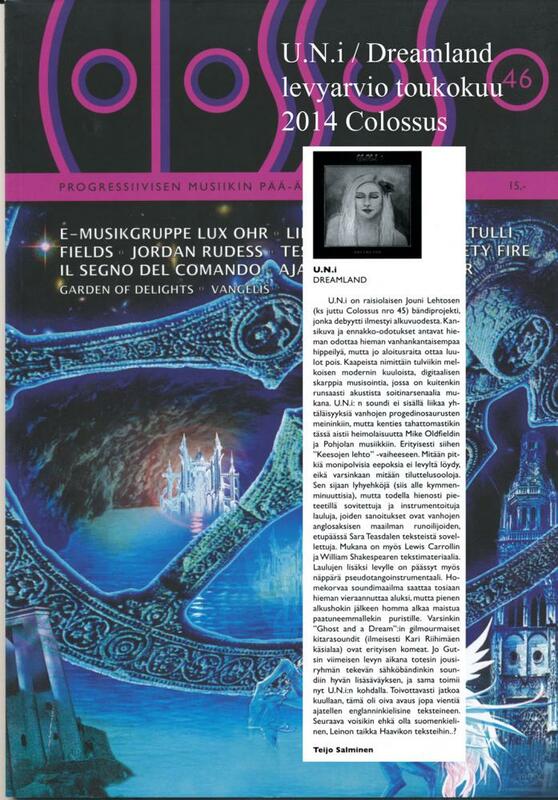 A 10 song album was released in january 2014 on Running Moose Distribution www.runningmoose.fi as well as in digital streaming & download -versions. 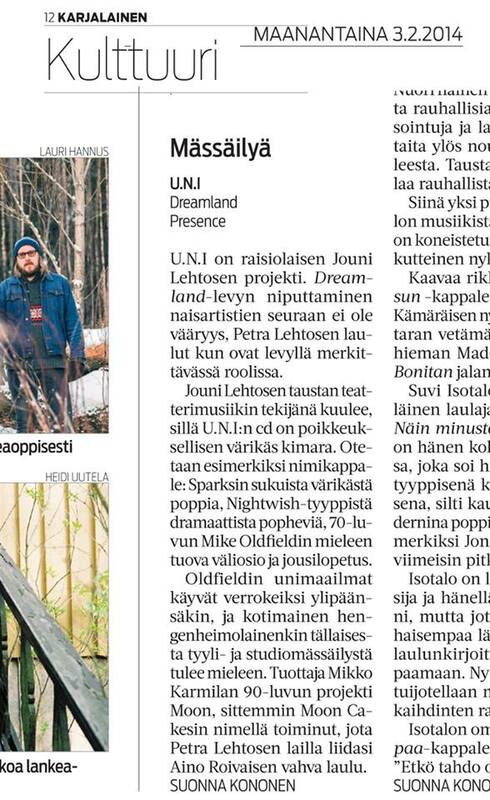 U.N.i is: Jouni Lehtonen - keyboards and electronics, guitars, mandolin, accordion, percussions, wooden flutes, kantele and background vocals. U.N.i Guest Musicians: Petra Lehtonen - lead and background vocals / Jussi Ahonen - bass / Markku Tuomi - drums / Kari Riihimäki - electric guitar solos and textures / Emmi Salmi - violin / Liisi Uusitalo - violin / Tuuli Amrahova - alto violin / Johanna Jaakkola - cello / Hanna Kalske - background vocals / Jukka Vaajoensuu - saxophone / Additional vocals - Lubena Nova as "The Witch" / Featuring Sofia Källström as "Alice"
7. THE CHARM 04:24 - Lyrics adapted from William Shakespeare's (1564-1616) poem ”Song of the witches"
8. A GHOST AND A DREAM 04:54 - Lyrics adapted from Madison Cawein's (1865-1914) poem "A ghost and a dream"
9. PHANTOMWISE 04:10 - Lyrics adapted from Lewis Carroll's (1832-1898) poem "Epilogue to through the looking glass"
10. BURIED LOVE 04:46 - Lyrics adapted from Sara Teasdale's (1884-1933) poem ”Buried love"